I give 2 severed thumbs up to the newest trend in horror. 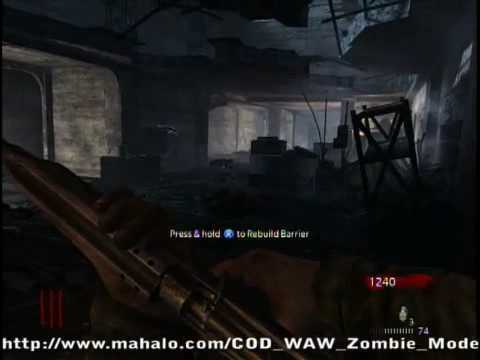 Heil zombies! Let me preface this by saying: I’m Jewish, and in no way take the Holocaust lightly. I am the grandson of two survivors, I have made the trek to Auschwitz, Majdanek and Treblinka, I’ve learend the history and the last thing I ever would want to do is mock the atrocities committed by the Nazis. With that out of the way, let’s get down to business. Motherfucking. Nazi. Zombies. (From Norway! )The big buzz movie at this years edition of the Montreal Fantasia Film Festival, which celebrates the best in offbeat cinema, was a little slice of celluloid called Dead Snow. Let me put it this way; there is over the top, and then there’s Dead Snow. It’s a traditional zombie movie, with all the standard props: a shotgun, a chainsaw, insane levels of gore (it’s so graphic, it makes Sam Raimi’s Evil Dead movies look like freaking Bambie), but with one twist: the zombies in question are a troop of Nazi’s, hunting for a treasure trove of stolen gold, and literally tearing apart all those who get in their way. The movie is sick, funny, digusting, juvenile and remarkable all at once. My favourite line: one character to his friend, who is contemplating amputating his own arm after being bitten for fear of becoming a zombie: “Isn’t your grandfather Jewish? Do you think they’d want to recruit a half Jew?” My only complaint is that by the end, you start getting a bit numb; one disemboweling bleeds into another (pun definitely intended), but the film is still a refreshing take on a genre that has started to grow stagnant again, after a marvelous rebirth a few years ago with 28 Days Later. This is not a Romero zombie movie; there is absolutely no social commentary hidden inside (which is a good thing, as in the case of his latest, Land of the Dead, Romero through out subtlety and made a zombie flick that was pretty openly about the the struggle of the proletariat). 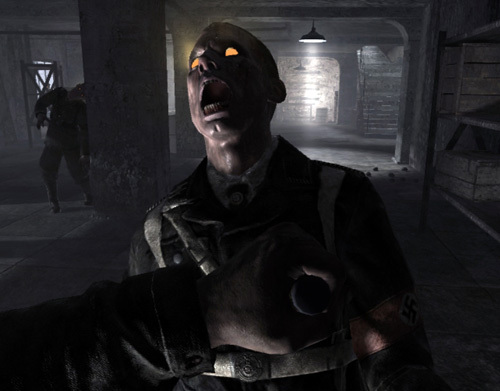 I don’t know if the guys who made the newest Call of Duty game were inspired by Dead Snow or just also thought a Nazi Zombie is a horrible thing to waste. I had been meaning to pick the game up, as I’m a massive fan of the COD franchise. Hell, me and my roommate have even invented a delightful drinking game to play while partaking in a round or two; every time you die, you drink. Fans of the game realize you can die up to 75 times in a 10 minute round, so understandably, this is the perfect way to spend a Saturday evening pre-drink. Still, I had been putting off buying the game, due to a) laziness, and b) being cheap. Both those excuses flew out the window when I learned of a very special feature: a co-op mode where you and a friend or 3 run around a house, barricading yourself against an onslaught of undead Krauts. Watch the youtube video below. Mind boggling doesn’t do it justice. While I was sitting here writing this little article, I started wondering about the significance of Nazi Zombies. Is it cheapening what happened in Europe almost 7 decades ago? Is it right to reduce genuine, chilling evil to a cartoonish caricature? 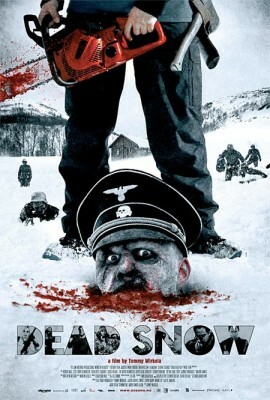 Why did a movie like Dead Snow (known also as simply ‘The Nazi Zombie Movie’) garner such enthusiasm within a certain portion of the population prior to it’s release? The only explanation I can come up with is that the fact that this game and movie were made is proof that Naiism still holds the distinction of being the closest thing we have to the living embodiment of evil. Allow me to explain: Zombies have for years had a cult following. People enamored with George Romero’s Living Dead series have managed to turn re-animated corpses into almost lovable figures (see the movie ‘Fido‘ for proof). Zombie walks have become a common form of protest, as well as exciting social events. We’re not scared of Zombies anymore, because we’ve started to identify with them. In Romero’s 2005 film Land of the Dead, zombies and the poor were treated the same – riff raff whose lives and happiness (if an entity composed of rotting flesh can feel happiness) were of no concern to the rich (as embodied by Dennis Hopper’s sleezy iron fist ruler). We’ve been downtrodden, homogenized, brainwashed… any social ill, you can use a zombie to symbolize it. Zombies also have a simplistic approach to life (or undeath, if you will) that can seem almost quaint in our information overloaded lives. They shuffle, they eat, and if they lose a limb or two along the way, they take a pretty positive existential attitude towards it, and keep on truckin’ (this is why Zombies are cool while those putzes prancing around as vampires in Twilight are just really, really, really lame. Less talky, more blood sucky, please). So how do you take something we’ve become so comfortable with, and return it to its horrifying roots? You combine it with the most vile, repulsive concept possible: National Socialism. You mix all this together, and voila, you end up with Dead Snow and World at War. I guess it also helps that it’s just fun seeing if you can make a zombies head pop off via shotgun blast. It’s unusual for me to discover something on the web that is as entertaining and intriguing as what you have got here. Your page is sweet, your graphics are great, and what’s more, you use source that are relevant to what you’re talking about. You’re definitely one in a million, great job! Wish you Happy New Year!